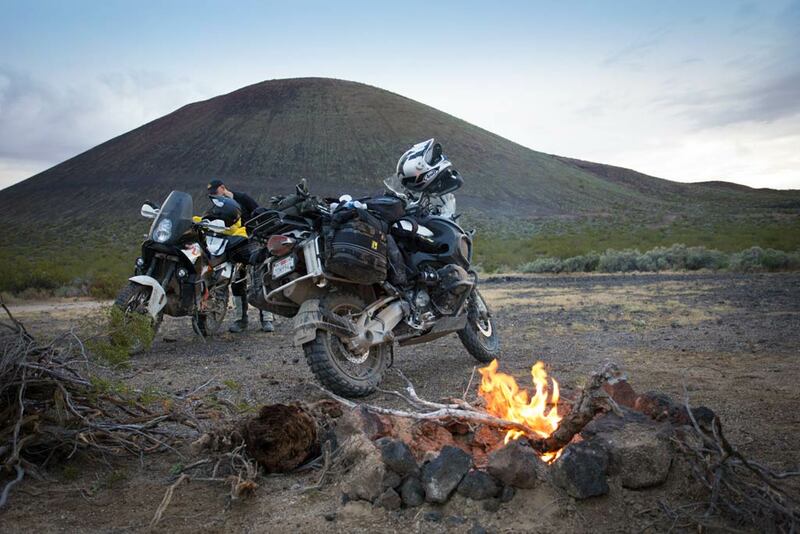  Useful survival tips for Adventure Riders exploring remote wilderness areas. You’ve been meticulously planning your big adventure and now you’re ready to go. Your motorcycle is all set up, gear and luggage sorted out, you’ve got a reliable GPS with you, flights, bike shipping and visas all figured out. What more could you need? 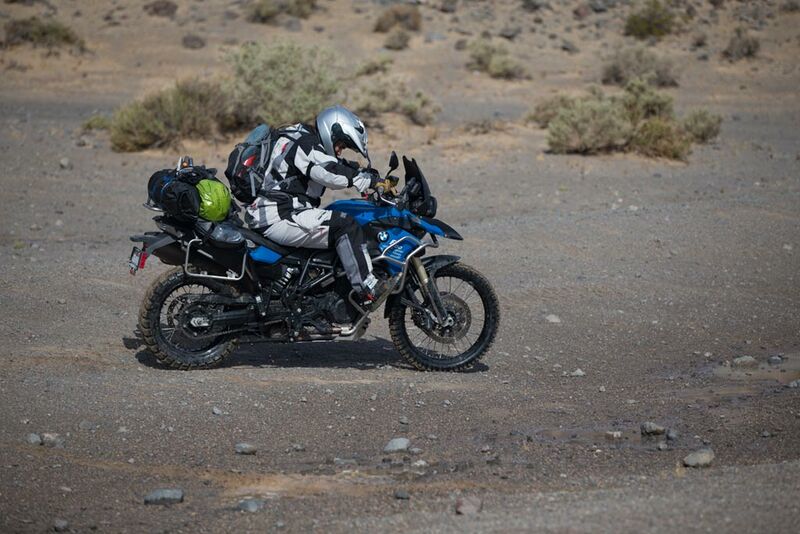 A lot of riders take an off-road riding class or two before they set out on a long overland journey abroad. But what about survival skills, especially if you’re headed to really remote corners of the planet? 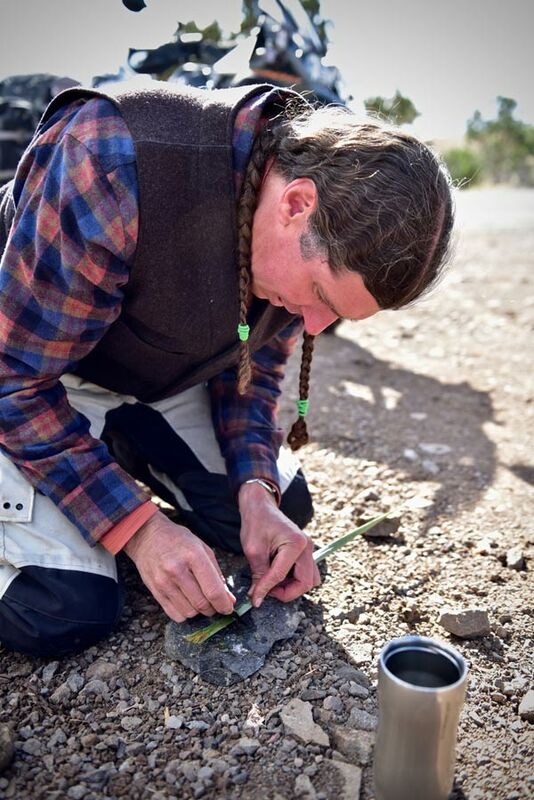 Matt Brummett, founder of the Rule of Five Wilderness Company, has been teaching survival and ancient living skills for two decades now. 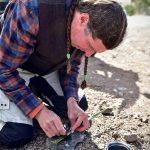 According to him, underestimating the wilderness is never a good idea – and to be truly prepared to go on an adventure, you need to master a few basic skills. 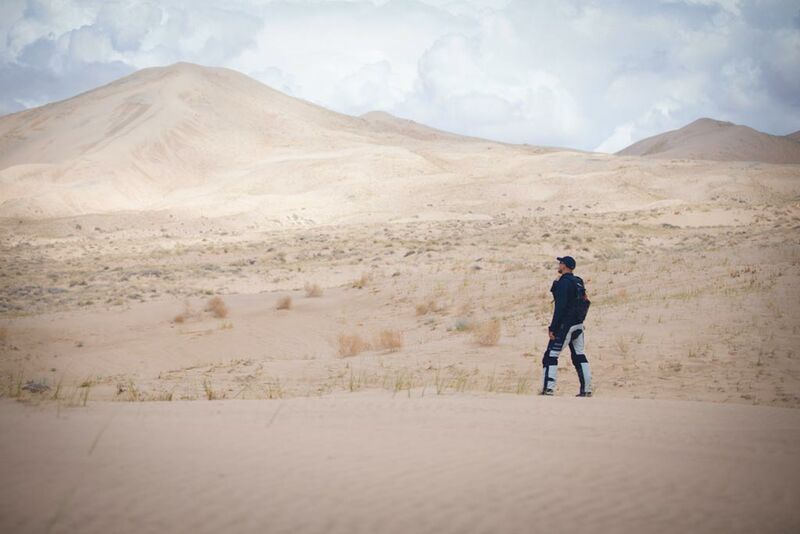 ‘On any expedition, including adventure riding, the goal is to avoid a “survival” situation and if you plan properly, the ease of how you make it through the emergency is increased. The more you can train in various conditions and the more proficient you become in outdoor skills the easier it will be in stressful situations’, – says Matt. So what are the absolute must-have survival skills for adventure riders out there? ‘First and foremost in a survival situation is your ability to remain calm and collected. Realize you’re going to need to improvise and adapt to the situations at hand. Get ready to endure the uncomfortable. A survival situation is by nature taxing on the body as a whole, physically, emotionally, mentally and spiritually. This being said, the skills I deem most important are these: first of all, get your head on straight and get positive. Second, think shelter. Third, fire. Then, find water. Finally, start signaling for rescue. Now you can figure out where you are and how to get out’, – says Matt. According to Matt, there aren’t any wilderness skills that ADV riders should be especially aware of as opposed to hikers or mountain climbers – but there are a few things that motorcyclists should keep in mind. ‘Something to be aware of as ADV riders, is that you can reach more remote places faster than with human powered travel. It’s easy to lose track of how far from civilization you are and what’s required to get back. This being said the risk for injury is increased while at the same time you have a great resource, meaning your bike, if you have to cannibalize it for items’, advises Matt. When you find yourself in an emergency situation, do not take unnecessary risk, try to remain calm and be ready to improvise. A lot of ADV riders carry a GPS messaging device in case of emergency. But devices fail and in some regions help is days away or may not come at all. Other than transmitting a satellite SOS message, what is the best way to get found if you are exploring remote wilderness and something happens? ‘People looking for you are using all of their five senses, with sight and sound taking priority in a survival search situation. You’re hoping that someone is paying attention to see the “signal” you set up. The use of fire, mirrors, designs on the ground, contrast movement and noises are all important to implement. Remember, you want to be found because you’re in a potentially life-threatening situation. You want to be as annoying as possible both visually and with noise. An example of a visual signal to be found is: Using a signal mirror to “flash” something in the distance, in bursts of three, over and over or hanging a bright neon orange vest on a stick with continual movement. You want to catch someone’s attention out of the corner of his or her eye. Pack emergency gear for the environment you are in and know how to use it. Use your horn, bang on pots and pans, carry a whistle and remember -in bursts of three. Don’t even try to yell, you’ll burn out your vocal cords; a whistle is well worth the investment. Three is the universal signal for distress. Make X’s on the ground with contrasting color so it stands out. Adventure riders usually prepare as best as they can: invest in good quality gear, set their bikes up for long distance, research the countries they will be traveling through and so on. But is there something we’re all getting wrong? 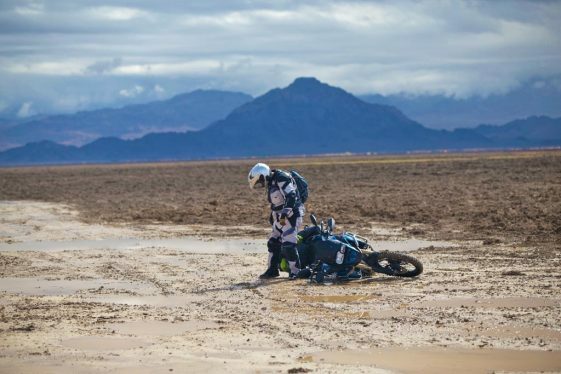 ‘When it comes to adventure riders and bad habits, what I have noticed most is people exploring alone with gear and bikes that are too much for the person, and carrying either too much gear or too little. Another common bad habit I see is, people will take gear into the field untested, not knowing how to use or set up the item. I would recommend testing and practicing with your gear before you actually need it. A hard one for individuals to admit is we tend to overestimate our skill level and confidence. When we are in a situation beyond our skill and ability level, this puts undue stress on the body for a period of time until the cause of the stress goes away. This chronic stress drains the body over time creating tiredness, which leads to sloppy decision-making. Make sure you test your survival gear and lifting techniques before you leave on a trip to avoid having to “figure things out” while under stress. When true stress happens (fight or flight), the chemical cocktail (cortisol and adrenaline) that is coursing through our veins is what allows the body to focus all of its energy to either fight off the threat or run from the perceived enemy. However, when this fight or flight is happening do not expect to think rationally. I would also mention we humans have a freeze mechanism, where a situation is so new and overwhelming to us, that we just don’t know what to do’, – explains Matt. Great tips. Earlier this year, I was doing solo riding in a very remote area and got completely stuck in mud on a hillside. Staying calm was key as I only had a few hours of daylight left and it was unlikely anyone was coming down the trails and there was ZERO cell coverage. Removing most of my gear and and luggage and taking about 2 hours to leverage and drag my bike out was key. I scavenged the local area for wood and rocks to help “unsuction” my Tiger 800xc from the mud. It was a good learning experience, but taught me to trust my gut and not try to “power through” — i.e., I overestimated my skill and the ability of my tires to shed mud — and err on the side of caution especially riding solo. Sounds familiar. Did something similar in Utah a couple years ago. Solo riding in the mountains, and thought I spotted a large standing black bear not far away while I took a water break. So much for the break! I was taking a short cut over an 11,000′ + peak (Henry Mountains). Just short of the summit took an outside run on a rocky steep incline corner (still a forest road) and lost it, piling the 700lb adv bike on a protruding boulder. Removed the bags, wasn’t sure I could get it back and righted so I initiated my SPOT beacon, knowing it make take a while to kickstart Search and Rescue. I righted the bike, got it started and thought I had turned off the SPOT…. but didn’t. Calls from Utah Search and recovery freaked out my friends and family for a few hours till I drove 25 miles back to civilization. Lesson learned. Best to not ride solo in the middle of nowhere, and oh yeah, really turn off the emrgency beacon if not needed. Good to know the original version works!